I come to my career in marketing by way of a degree in Physics. In college, I spent my summers researching fusion at Lawrence Livermore National Laboratories, and came “this close” to accepting a role in a PhD program at MIT. Instead, I decided to explore a role in “business” (my first job was in management consulting) and almost 20 years later I haven’t looked back. I don’t regret the fact I studied physics — and not something more mainstream for my profession like business, marketing, or economics — because physics trained me to think in a rigorous, quantitative way. In fact, I believe this left-brained view of the world is the exact thing that makes me a good marketer today. Adamantine Physics versus Squishy Marketing? Nope. On the face of it, physics and marketing appear to be very different disciplines. People think of physics as ruled by universal laws that can be rigorously studied to understand everything from the unfathomably small to the extremely large; marketing is seen as an “arts and crafts” function that comes up with jingles, throws parties, and prints color brochures. But I don’t agree. While marketing may not always follow universal laws like physics does, I believe that it can and should be a rigorous, left brained discipline. It can be tested and measured. And with the right level of rigor and quantitative measurement, we can elevate marketing to a science. So, what did adamantine physics teach me about so-called squishy marketing? (If you don’t know what “adamantine” means, look it up; it’s one of my favorite words, taught to me by Harvard professor Stephen Jay Gould.) It taught me to build models for how the world works, providing analogies that can apply marketing; it taught me math skills I can apply to marketing problems; and it taught me some fundamental truths. There are many lessons; here are some of them. In classical mechanics, a harmonic oscillator is a system that, when displaced from its equilibrium position, experiences a restoring force proportional to the displacement. In simpler terms, that means the more it’s pushed away from the equilibrium “resting” position, the stronger the force to bring it back. And because of momentum/inertia, as it moves back to the resting position, it will overshoot and go to the other side before coming to a stop and then returning in the other direction. Back and forth it goes, swapping potential energy for kinetic energy and back again in a familiar wave pattern. Oscillators like this show up all the time in practical physics, from simple pendulums to masses connected to springs to the vibrations of a guitar string. They also serve as good models to study other systems, including clocks and electrical circuits. One of the interesting aspects of these systems is that they resonate at a natural frequency (e.g. number of swings per minute). For example, a pendulum (at least a simple one with a negligibly light string and small angle swings) swings at a frequency determined solely by the square root of the length of the string; the mass of the object being swung is irrelevant. This means that you and your four-year old child will both swing back and forth on the playground at the same frequency. This has interesting implications for how much one can push, or drive, the system. Imagine the park swing again. Pushing in time with the natural resonant frequency makes a swing go higher and higher; you can increase the amplitude or amount of the swing. But if you try pushing at any other tempo, you lose efficiency, since at times you will be pushing against the natural motion of the swing. I think there is a good lesson for marketers here. Too often, we want customers to buy from us on our schedule, when we have campaigns to run or monthly goals to meet. But we need to recognize that each buyer has her own natural frequency for when she wants to act. Like pushing the swing, marketing can be a powerful effort to drive the system – the right message at the right time can really resonate with the buyer. But we need to recognize the buyer’s natural timing and synchronize our marketing pushes with it. Otherwise, the marketing may end up pushing against the buyer’s natural frequency, damping the energy and reducing marketing effectiveness. So, the physics is that systems have a natural frequency and driving the system won’t change it (though it can increase the amplitude of the oscillation). The marketing is that we need to understand each buyer’s natural frequencies and personalize our outreach to resonate with their innate rhythms; trying to drive action on any other frequency will always dampen the results. But what is transmitting the force, or interaction, between objects such as the magnet and the metal refrigerator? A modern theory is that the objects actually exchange “force particles” (called bosons) to attract or repel each other. As an analogy, imagine two skaters on an ice pond. One skater throws a heavy ball at the other and he is driven backwards (for every action there is an equal and opposite reaction); then the other catches it and she is driven backwards. The exchange of the particle “repelled” the two skaters. It’s a little harder to use an analogy to explain how exchanging particles can attract two objects (it has to do with the Heisenberg Uncertainty principle), but I hope you’ll trust me on it. This suggests an obvious marketing analogy. Want to attract customers? Stay in close contact by exchanging valuable content. Every time you share useful, enjoyable content – and they engage with it – you are nurturing the relationship and bringing them closer. Want to push them away? Try sending a steady stream of promotional, sales-y, product-focused content — that’s a sure-fire way to make your drip marketing feel like water torture. You marketing should be about dialogs, not diatribes. So, the physics is that exchanging particles between objects causes an attractive or repulsive force. The marketing is that exchanging useful, enjoyable content creates a force of attraction, while promotional messages create a repelling force. Equilibrium in a system occurs when all acting influences are canceled by others, resulting in a stable, balanced, or unchanging system. As a simple example, consider a book sitting on a table; the force of gravity pulling down is cancelled by the push of the table up, and the book stays still. If a system is not in equilibrium, if possible there will be a transfer until equilibrium is achieved. Consider a two-sided container, one side with plain water and the other with sugar water, separated by a semi-permeable membrane that lets water molecules through but not sugar. Because the concentration of water is lower on the sugar side, the water will flow through the membrane until both sides have an equal concentration. Equilibrium is achieved when adding or removing water from either side would upset the balance. To see the lesson for marketing, I need to explain the concept of diminishing marginal returns. This states that as you put more and more input into something, you reach a point where each additional input yields a progressively smaller increase in output. It’s like a kid with a giant box of candy; the first bite is great, but eventually each bite becomes less and less enjoyable. We see this effect with marketing investments: if you double your investment, you won’t double your return. There are many reasons for this, but the most basic is that a smart marketer will choose the best campaign first, the second best next, and so on. By the time she gets to higher-level investments, only lower-performing options are available. 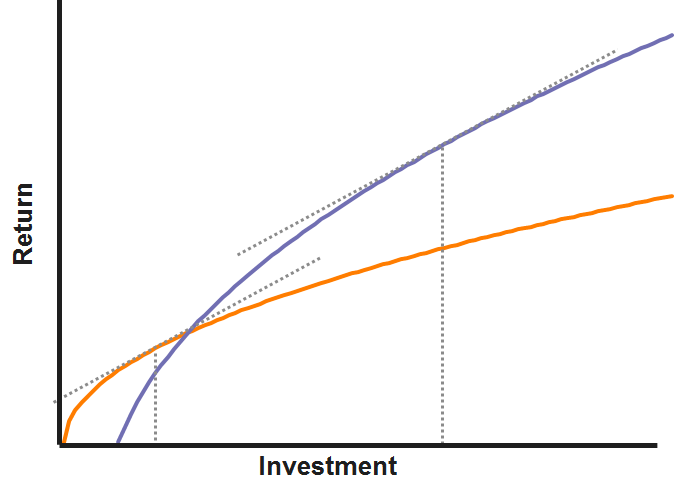 Each marketing investment will have an investment-to-return curve that looks something like the ones below. Now, here’s where the physics (or at least mathematics) comes in. It turns out that the “slope” of the curve represents the marginal return; it tells you how much extra return you will get for an additional unit of investment at each point. (You can calculate the slope by taking the first derivative of the equation for the investment curve.) If you are at a point on the curve where the slope is steep, then you can get a lot of extra return by moving to the right and investing more. If the slope is nearly flat, then you will lose very little return by moving left and investing less. The implication is that if you have any program that is at a place on the curve with a steeper slope than another program, then you can maximize total return by taking investment out of the less effective program (you will lose relatively less return) and putting it into the program that is at the steeper part of the curve (you will gain more return than you are losing). If you do a lot of tradeshows, you’re probably at the flat part of the curve; you can probably make more overall return by dropping a few of your lowest performing events and putting the investment into a channel that is lower on its curve, perhaps email. So, the physics is that equilibrium is achieved when you can’t take an influence from one part and move it to the other without causing an imbalance. The marketing is that the point of maximum return on a marketing budget is when you can’t take investment from one program and use it better in another. A key hallmark of modern physics is that reality is not what we perceive. The more physicists discover about the universe, the more difficult it is for people to intuitively understand the discoveries. People used to believe that the world was flat, that the Earth was the center of everything. But we now know that we orbit a star, one of 400 billion on the edge of a giant galaxy, that itself is just one of hundreds of billions of galaxies in a universe at least 46 billion light years across. Check out this Scale of the Universe for a great visual depiction of just how small we really are. With the special theory of relativity, we learned that observers moving relative to each other experience time differently and can even disagree about when events happened. Taken to the logical conclusion, this means that all times exist simultaneously, and we simply experience moving through it. Quantum mechanics teaches us that particles don’t exist at any specific place but instead are spread out in a probability wave. And most recently, string theory suggests astounding things like the fact that our universe is not just three dimensions plus time, but perhaps may be 11 dimensional, with the extra dimensions “curled up” so small that we can’t observe them. None of this makes sense intuitively, since it’s not what we see and perceive. But it’s true. So how do we understand it? The only way is with theory, mathematics, and experimental testing. If physics has taught me anything, it’s that these are powerful tools to understand the world we live in. And, they can be powerful tools for marketing. Too often, however, marketers rely on intuition and experience, making them vulnerable to being questioned and second-guessed. As Ira Kalb of the Marshall School of Business points out, no non-physicist would go up to a trained expert and tell them that their calculations were wrong, but often the non-experts in marketing have no qualms about expressing their opinions about a campaign or creative design. So, the physics is that the world is actually much more complicated than we perceive, and we need to rely on data and analysis to make sense of it. And the same is true for marketing. Don’t trust intuition about what works; understand it with theory, mathematics, and experimental testing. What has physics taught you about marketing? Please share your thoughts in the comments.